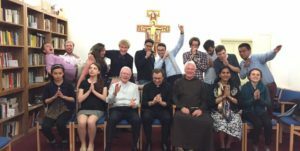 We hope that Catholic former students at Durham will want to keep in touch and support the work of the Chaplaincy in their prayers. If you are passing through Durham, do drop in and say, “hello”, whether you were here five years ago or fifty! We are continuing to develop our database of Catholic alumni – if you register your details with us, we’ll keep you up-to-date with developments here. To register, click here. We send out Alumni e-newsletters about once per term. Back numbers are available on this website, and if you have any news for future issues, do drop us a line at alumni@durhamcatholic.org. At least once a year we try to invite Alumni to a chaplaincy event – details will be in the newsletter. The Chaplain and Catholic Society are always pleased to hear of any ways in which alumni might be able to help current students – let us know if you have any ideas! One of the main ways we would ask all our alumni to help is by uniting themselves in prayer with the Chaplaincy. University years are an exciting and challenging time, and students need all the support possible, both divine and human.